During my time serving as a TFI Fellow at Kilbil High School & Junior College, Pune. I used my engineering skills to put together various versions of "community computers" for use in our classrooms. I tried to use existing or easy to source components to put these together. When I came to Kilbil, our school already had two of these and they got me thinking of building one for myself. This black box has a projector, a full featured computer and speakers all rolled into one box. It comes along with an infrared remote control and a wireless keyboard and mouse combo. K-Yan is an initiative by IL&FS Education. This device is more than just a projector. The onboard computer comes loaded with content (flash content, videos, photos, photos, quizzes) aligned to your state board's syllabus. Its remote control has a builtin laser pointer that can turn the projection surface into a a sort of digital whiteboard. The latest version of this device has a TV tuner inside it thereby turning it into a TV as well. In fact as far as I know, the word "Community Computer" was coined by them. This is the first setup I tried out. Since Raspberry Pi has an HDMI interface, I had to purchase an HDMI capable projector. The most popular, cheapest one available at that time (July 2014) was BenQ MS521p for INR 30,000. My friends chipped into sponsor the purchase of the projector. 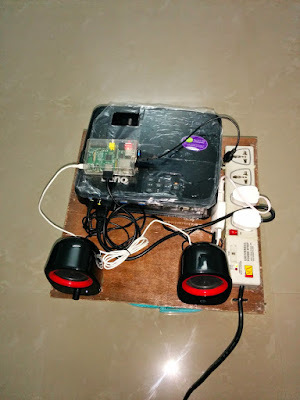 I threw in a Raspberry Pi 1 which I had lying around, bought a wireless keyboard/mouse combo and connected some USB speakers and I was done. I mounted all the things on a piece of square plywood and I was done. 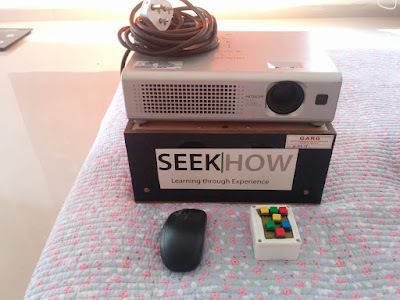 Because Rasberry Pi only had HDMI out, you need an HDMI capable projector which are a few thousand rupees more expensive than VGA projectors. To use omxplayer to play videos, you had to issue commands via a terminal - cumbersome in a classroom environment Now days you have the OMX Remote android app to help ease that, Also the latest version of Raspbian has lots of improvements when it come to playing videos, showing images and presentations. Build details and links to flipkart pages of the components I purchased to assemble this are mentioned in the blog post below. This one has been my workhorse for the most part of 2 years of my fellowship. When I wasn't satisfied with version 1 of what built using Raspberry Pi 1, I swapped out the Raspberry Pi 1 with an Intel NUC PC which is a full-fledged small form-factor computer manufactured by Intel. 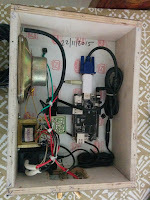 Since the version 1 was very cumbersome to carry, I got the components mounted inside a big cabinet intended for housing a stabilizer so that it became easy to carry around in the school. The Intel NUC PC runs Windows and since it has WiFi inside it, I could now install Google drive and sync stuff from my home PC to this Community Computer without the need or use for transferring files using USB flash drives (I had to get internet connection installed at school for that). When another TFI fellow approached me to build one for her too, I replicated the effort and made one for her too. Full featured windows PC - can run all sorts of programs including prezi. Internet works - can research topics on the fly to answer student queries in class. Google Drive works - no more copying files using USB flash drive. Windows running on NUC PC take quite some time to boot up - this wastes precious classroom time. Prone to viruses if antivirus is not installed. If you install anti-virus, you end up slowing down the PC. Kilbil school's science lab had a Hitachi CP-RS55 installed on the ceiling. The projector had been sparingly used. So I detached it from its ceiling mount and decided to turn it into a community computer. To do that I got it attached to an old woofer box; inside which we installed an old APC8750 (An android based Single Board Computer with VGA output), and speakers and amplifier kit. 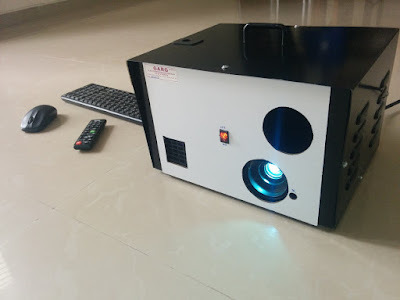 The projector is typical of what you would you find in lower income Indian schools - old VGA ones. 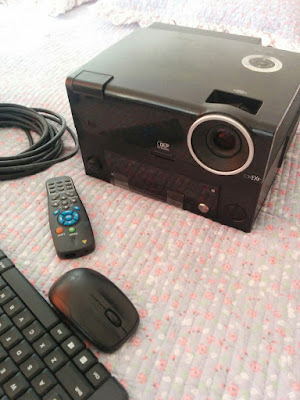 I figured, APC 8750 is a good fit for such projector because of its VGA output and Android OS. I added a Logitech mk220 wireless keyboard and mouse combo to the mix and voila I had another community computer on hand! I hacked the Wireless keyboard and traced the keys important for operating the APC 8750 and mounted only those in a small box. This made showing photos and videos on the APC 8750 very easy. I made sure to retain the arrow keys (for selecting apps) and Enter, Space and Esc keys for entering and leaving apps. APC 8750 has VGA output so will work with old VGA projectors lying around in schools. No need for HDMI projectors. APC 8750 has Android on it. So it can be operated with just a mouse. Also most Indian teachers might be inept at using a Windows PC but they have become good at finding their way around their Android smart phones. Having Android on your community computer immediately removes resistance to getting started on using one in their classroom. APC 8750's memory is flash based - no moving parts and all the data you want to show on the computer would lie on your USB flash drive. So no worry of data corruption incase of power failure. No worry of virus infections either. Video player app runs very fast and once you teach the teacher on how to download Youtube videos off the internet and place it in a USB flash drive, APC 8750 serves as an awesome media player! APC 8750 has a builtin browser. Internet access can be added using Ethernet or only certain models of USB WiFi Dongles. 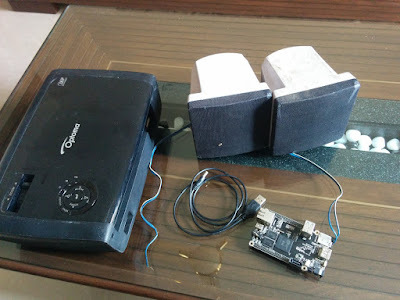 Instead of using scouring for the specific WiFi Dongle with particular chipset, I think using a pocket router (Like TP-LINK's TL-MR3020) hacked with OpenWRT acting as WiFi client would be cheaper and easier - you could connect the WiFi router to your school's WiFi, install the router inside your community computer and run a CAT5 cable from it to APC 8750. Built in gallery app is very slow to load photos from your flash drive and is sort of a deal breaker. Perhaps the newer APC Rock which is loaded with Firefox OS and still has a VGA output would work better in this regard. It is a good idea to think of building one of these using an old VGA projector. Make sure to use the newer APC Rock (Costs 59 USD) with Firefox OS which might have a non-buggy photo viewer app. Teachers at your school will love a community computer based on APC because its straightforward to use. Do make sure to teach them how to download videos off of YouTube beforehand (using Youtube video downloader HD or use http://en.savefrom.net/) using a Windows PC. They will love the fact that they don't have have to worry about viruses. This one is a still a work in progress. I found another old VGA projector (Manufacturer: Optoma) lying unused at school. 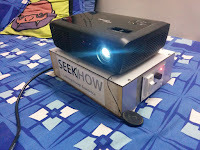 I have a cubieboard1 lying around which I plan to connect to the projector. Cubieboard1 runs Lubuntu. Lubuntu can play videos, display photos as well as PDFs. Since its a Linux based OS, it is immune to commonly floating around Windows viruses. Since the projector only has a VGA input and the cubieboard1 has an HDMI output, I plan to use a HDMI to VGA converter with this. Other components that I would need are the usual, amplifier circuit and speakers, Logitech mk220 wireless keyboard/mouse combo and a box to put it all in. USB Flash drive doesn't get automounted. So I created shortcuts to disk manager on the Lubuntu desktop for easy access and mounting.